Hungry and want something hearty, nutritious, and delicious in a flash? Well, this dish is for you. My Uncle Buddy used to make this for me all the time when I was a child. While Uncle Buddy has long ago crossed the Rainbow Bridge, his memory lives on in my family. And for me, his memory wouldn’t be complete without this quick and easy meal, which I haven’t made in years. 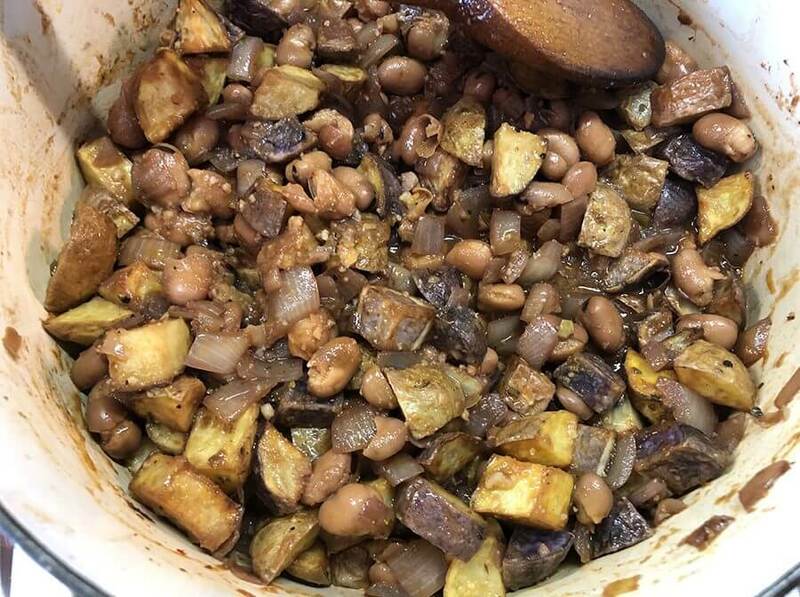 Uncle Buddy always made it with kidney beans. I didn’t have any; however, I did have two cans of fava beans. And I knew they would make a wonderful substitution! 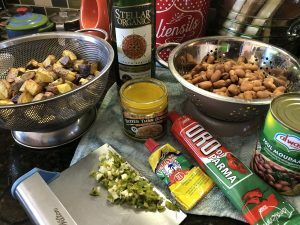 If you’ve been following me on my blog, you probably already know how very important I believe it is to do your mise-en-place first. Mise-en-place is a fancy French phrase, which simply put, means ‘to put in place’. I always take the time to prep and arrange all my ingredients before I even turn on the stove or oven. By doing this, I’m ready to go without hesitation; and I won’t forget any ingredients. It also enables me to clean up the kitchen (I abhor working in a dirty kitchen with a sink full of dishes). So, once my mise-en-place is done, everything I used to that point is washed and put away. That leaves me with clean counters. I’m ready to crank up the heat in the kitchen, i.e., turn on the stove. Rounding out my mise-en-place is my bowl of air-fried potatoes. 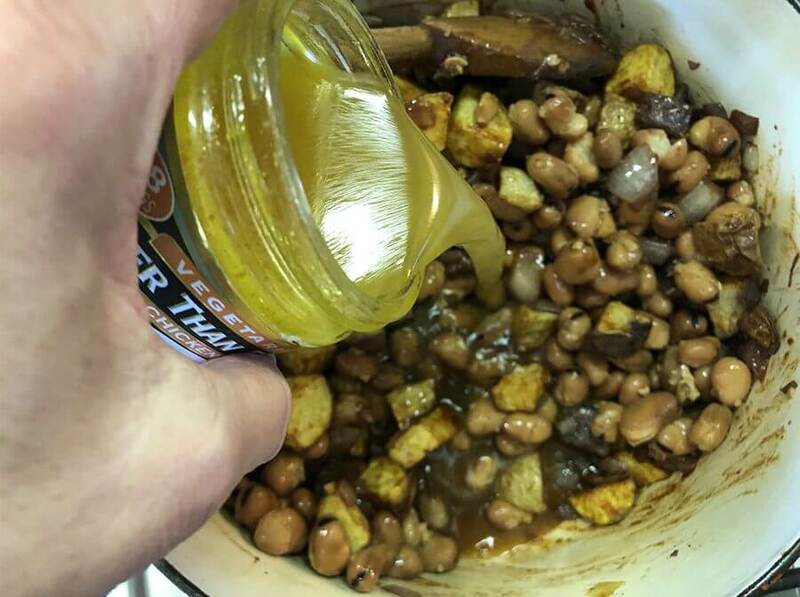 I used a 2-pound bag of the tri-color baby potatoes that I washed, cubed, gave a very quick spritz of extra virgin olive oil, placed in the air fryer at 360° Fahrenheit, and air-fried them for 12 minutes. They were browned on the outside and still a tad underdone, as they will continue to cook in the pot. 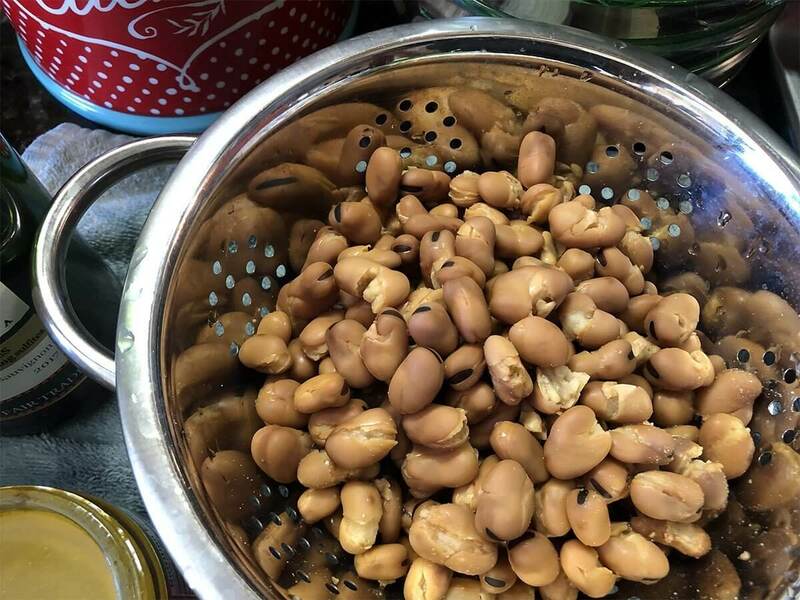 My last mise-en-place item is two cans of fava beans that I gently rinsed under cool running water and allowed to drain. As I mentioned earlier, my Uncle Buddy only ever used kidney beans; but use what’s in your pantry. While most often I used dry beans, today I wanted a quick meal, so soaking beans wasn’t going to happen. 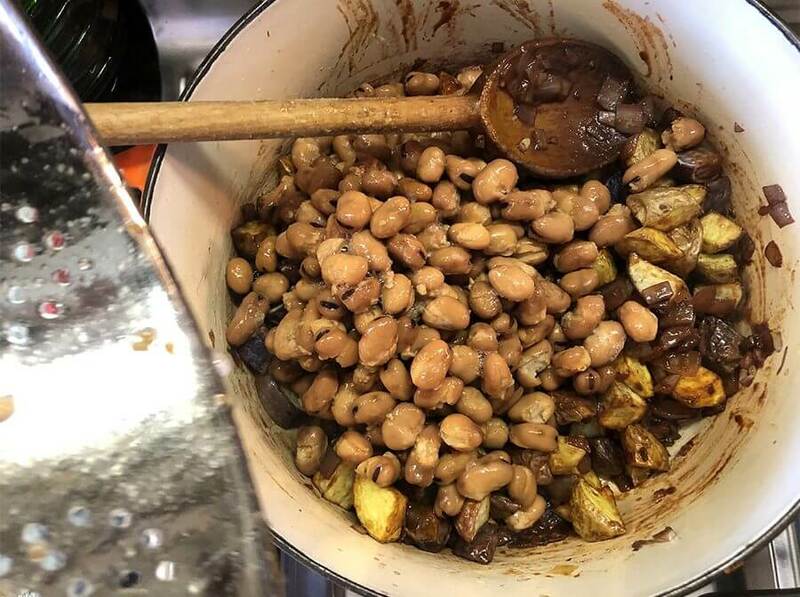 This is where having a well-stocked pantry, inclusive of several cans of a variety of beans will enable you to make a last minute meal that will wow the socks of everyone. Okay, so let’s get cooking. Into a heavy enameled cast iron pot I added two medium-sized chopped onions that I lightly spritzed with olive oil so they would not stick to the bottom and would also caramelize. Now, for those of us who are oil-averse, you could certainly skip the oil and use broth. This is the one step, however, that I never rush. 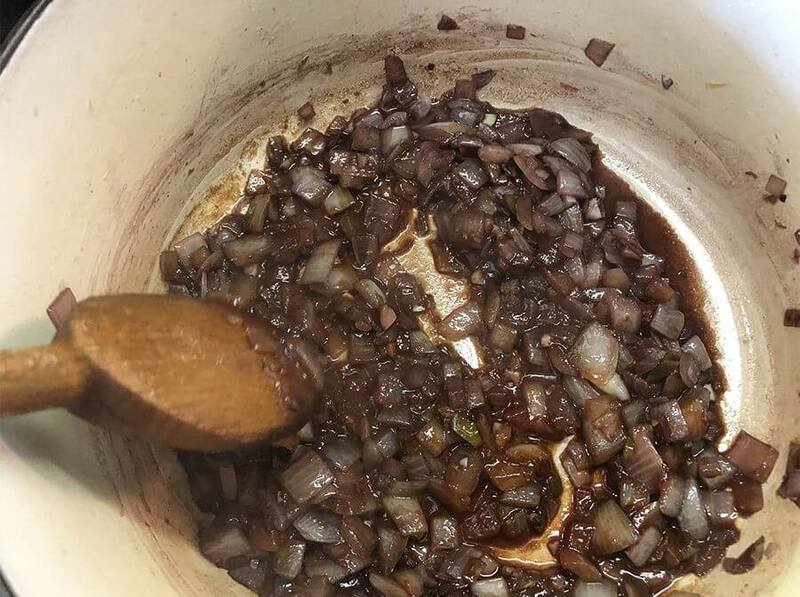 I sauté my onions on medium-low heat so they don’t burn but rather allow the sugars in the onions to gently give color to the onions and bring out their sweetness rather than having the burned taste from fast and furious. 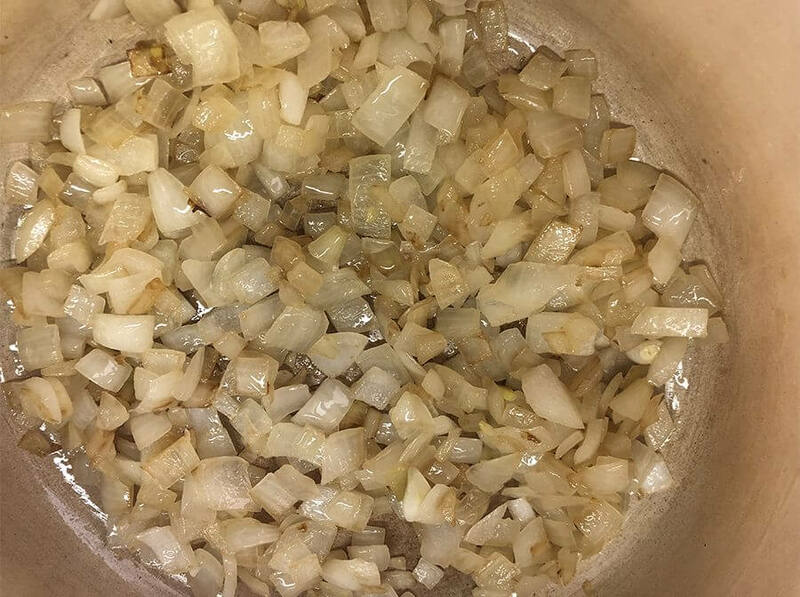 Once the onions have begun to take on color, I added 5 large minced garlic cloves and 1 large hot Italian pepper (optional if you don’t like heat; but if you do like heat, you can always add some crushed red pepper if the fresh pepper isn’t quite hot enough). 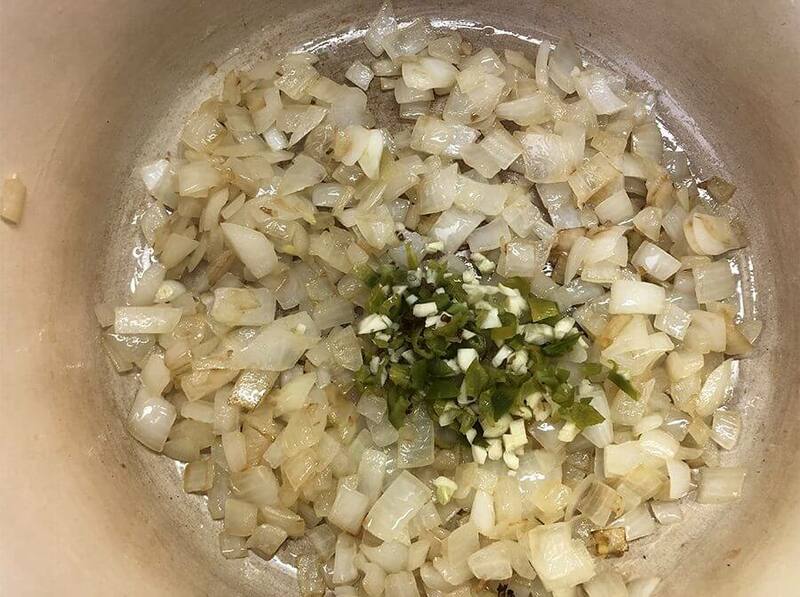 Sauté until the garlic becomes fragrant. What’s an Italian ‘stew’ without red wine? I had a potluck two nights ago and had about one cup of really good organic and vegan red wine leftover, into the pot it goes. 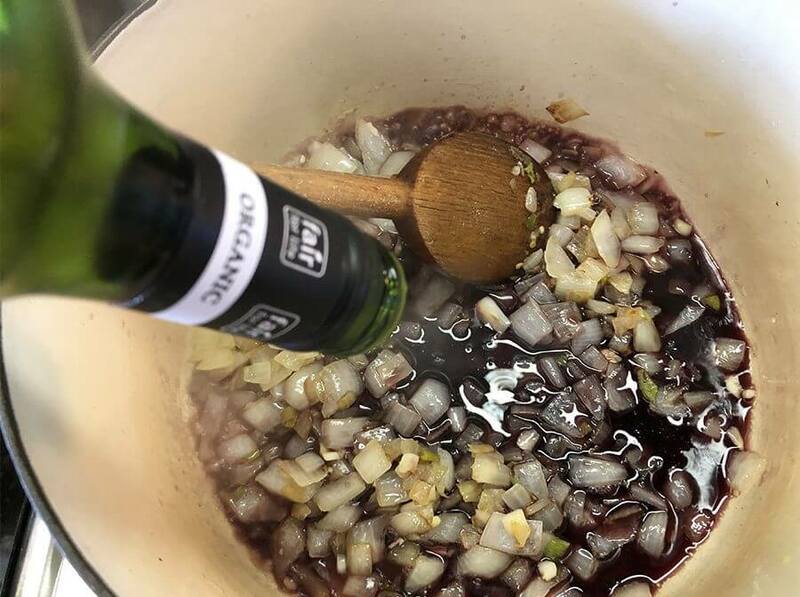 Allow the wine to reduce down and cook out the alcohol before going on to the next step. I added about a tablespoon of Harissa paste, which is definitely not Italian, but I had it on hand, so why not? 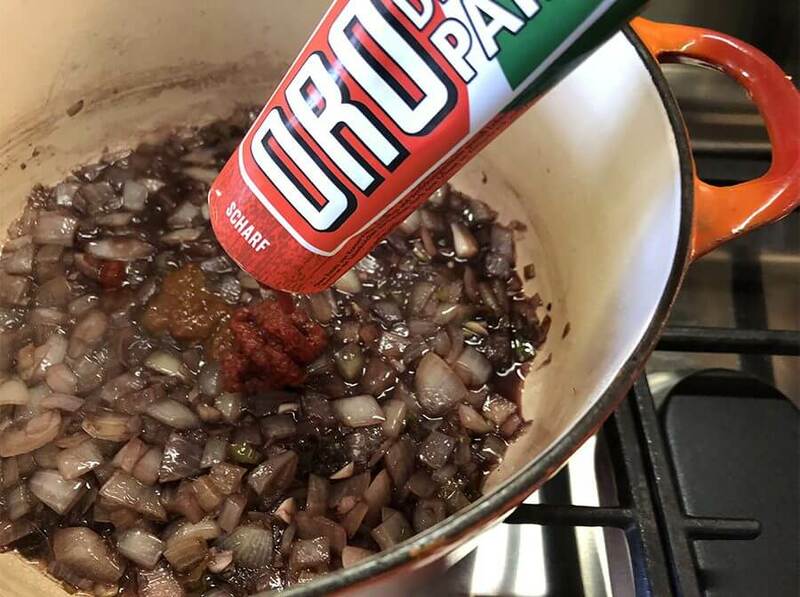 I always have a tube of really good Italian tomato paste rather than those small cans. I never really need the whole can, no matter how small it is. The tube is perfect. I use what I need and put the tube back in the refrigerator, ready for its next use. For this dish, I added a good two tablespoons to the pot. This is an important step. You want to ‘fry’ the tomato paste to cook out that raw flavor. Stir constantly for about a minute or so. You’ll know as the aroma coming out of your pot will be intoxicating. 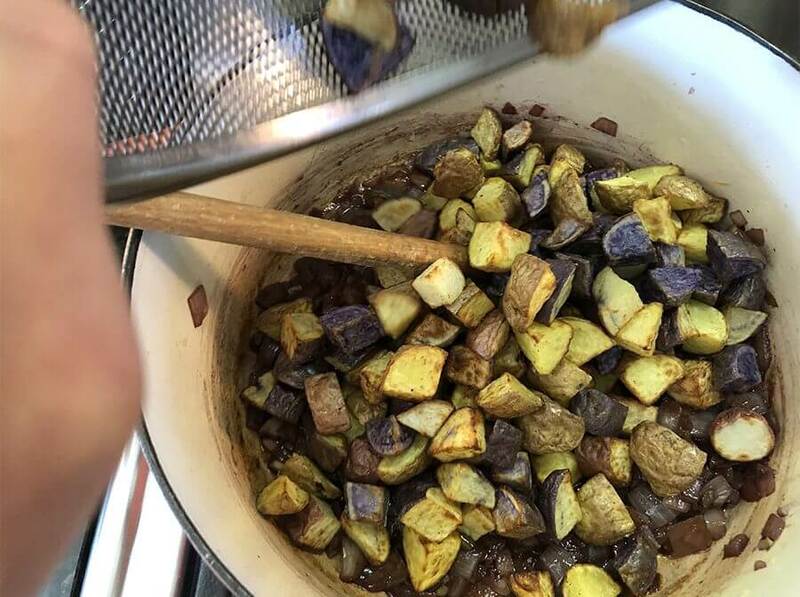 Add the potatoes and gently stir, trying not to break the potatoes but incorporating them evenly amount the other ingredients. Of course, some may break, but since they are not fully cooked through, they should be fine. Allow 2-3 minutes, stirring occasionally to heat the stew through and start to cook the potatoes through the center. Add your beans, and again stir to combine. Allow another 2-3 minutes, stirring occasionally. Pour in approximately one cup of broth. I used vegan chicken broth, but you could also use vegetable broth or vegan beef broth. Stir to combine, bring to a simmer, continue to stir. In approximately 3-4 minutes, the broth will become more of a glaze. 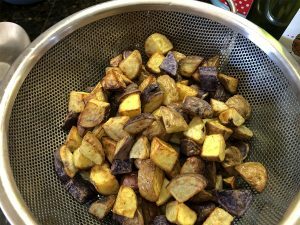 Test your potatoes, they should be cooked through but not breaking apart. 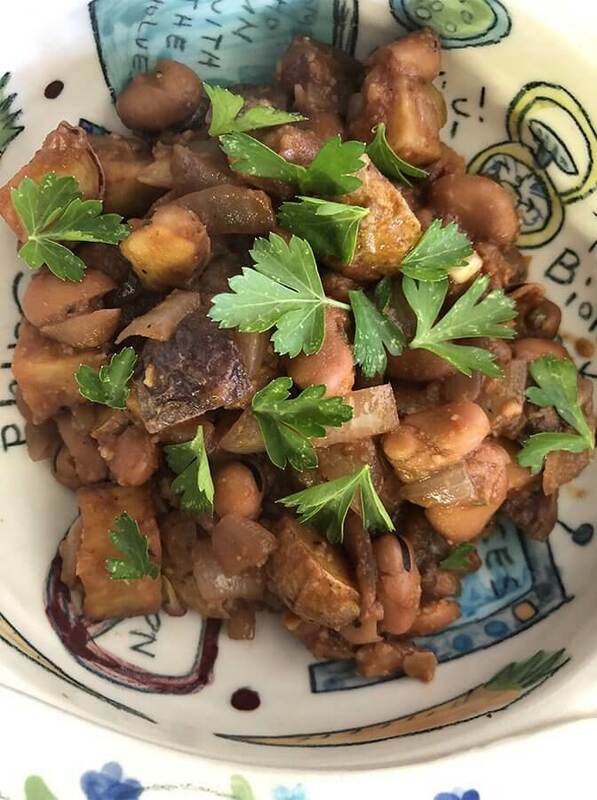 You are now ready to serve your Bean and Potato Stew. By the way, now is also a great time to park some of your stew in glass containers, allow to cool, then you use them for part of your batch cooking for the week and/or freeze some for a future meal(s). I will admit that the stew, while hearty, nutritious, and absolutely delicious, it is not the most colorful stew. Easily fixed. Garnish with parsley (cilantro would also work, but then it wouldn’t be Italian, but still yummy). The green parsley adds the color contrast that the plated dish needs but also gives an added punch of flavor.